If your Mac seems a little slower than it used to be it might be in need of a tuneup. Here’s the procedure I run for the Macs I’m responsible for. 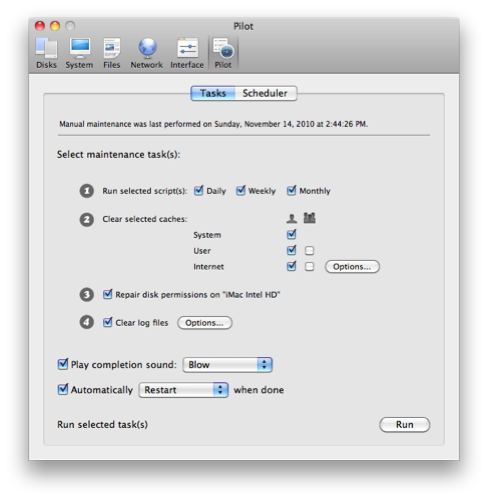 Done once a month, this routine will help your Mac to run its best. Cocktail does a lot of important stuff that has techie-sounding names, such as “repair permissions”, “clear caches”, “clear logs”, and “perform Unix “cron” scripts.” Fortunately, Cocktail knows what all of this stuff is, even if you don’t, and it knows how to do it right. My advice: download Cocktail, choose the “Pilot” option (right-most button in the Cocktail toolbar), make it look like the figure below, and then click “Run.” Might take a few minutes but it’s totally unattended. Let it do its thing, including the restart, and all will be well. HINT: restart your Mac BEFORE you run Cocktail, because it will run better if there aren’t other programs in the way. You can run Cocktail a few times without paying for it but eventually you will want to register it. $14.95 for one computer, $29.95 for five. There are other ways to perform Cocktail’s tasks but none that is as easy. NOTE: there’s a “Scheduler” button up at the top of the window. Click it and you can set Cocktail to run on a repeating schedule. You won’t make things worse by running Cocktail more often, so if you feel like having it run every Monday morning at 4:15 AM go right ahead. That happens to be the way it’s set up here and look how I’ve turned out. Step 2: Run Software Update (repeat until there are no more updates). Restart when they tell you to. Generally speaking the Software Updates are good things. Sometimes, rarely, a software update will have unintended consequences. For example, a recent software update caused problems for people who emailed PDFs via automatic means, from FileMaker, AppleScript, or Automator. The problem was fixed in a subsequent update but the weeks in between were rough. If you’re not sure, ask someone (me). Microsoft Office (Word, Excel, PowerPoint, and Entourage or Outlook) has an automated software update system that is supposed to keep those programs up to date. Apple’s Software Update won’t update Microsoft’s stuff, so you have to use Microsoft’s updater. Look under the Help menu in any version of Microsoft Word (or Excel, or PowerPoint, or Entourage, or Outlook) for “Check for Updates.” The Microsoft AutoUpdate program will launch and tell you whether there is anything for you or not. After you get one update you may “qualify” for another. Keep trying until there are no more updates. 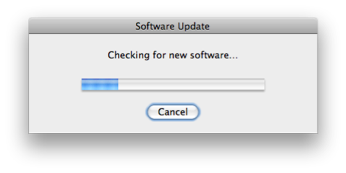 NOTE: after you choose “Check for Updates” you should quit Word (and Excel and PowerPoint and Entourage/Outlook). The updates cannot install when these Microsoft programs are running. I agree, it’s kind of goofy to complain about the programs being open when that’s how we got to the updates in the first place– fodder for another article. Microsoft’s updates often involve security issues so you really should install them. And that’s it! It takes a little time, but when done monthly it should be less than half an hour from start to finish, counting the restarts. NOTE: our Managed Service Plans include monthly maintenance at no charge for up to two machines, and at a reduced charge for others. I do the work personally, over the internet. You ought to look into this– it’s a time-saving, money-saving program and it’s all in your favor. Click here to learn more.